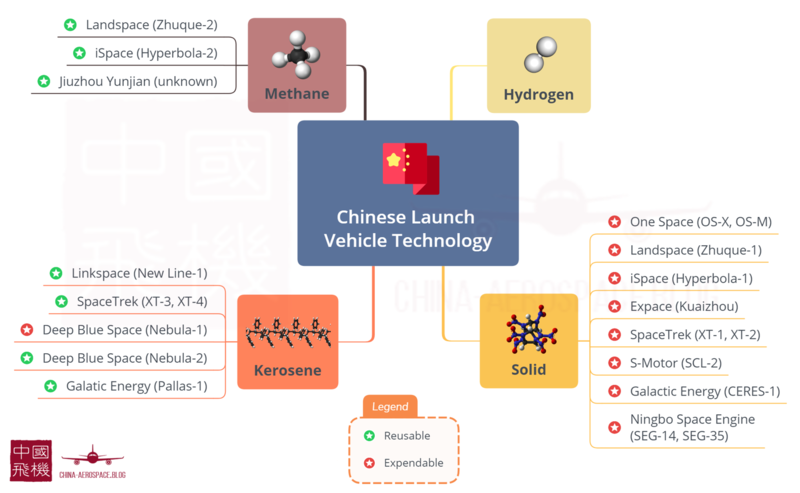 This article looks at the technical choices of Chinese NewSpace startups regarding propulsion technology and expendability/reusability, and what this reveals of their understanding of the commercial launch market. At the time of writing, we are entering the 5th year of China’s “Open Up Policy” in the space industry, which has enabled private capital to flow into space companies and triggered the emergence of a large number of startups. Among these newcomers are approximately 15 launcher-focused companies (according to our latest Space Infographics mapping), all hoping to provide satellite launching services to the world within 1-3 years. Most space watchers agree that this exceptionally high number of launcher startups will most certainly mean consolidation and /or bankruptcy of a majority of them while seeing the emergence of a handful of strong players. Each launcher startup will have to put forward a combination of exceptional operational performance, strong funding, and advanced industrial management to win the Chinese launcher race. A closer look at the technical choices of these NewSpace launcher companies can give us an interesting insight on the potential outcome. For the purpose of this article, a sample of 11 startups which have detailed their plans regarding launchers are scrutinized. The other ones are discussed at the end of the article. Firstly, almost all NewSpace startups are designing solid rockets. The reason generally put forward by these startups is the simplicity and maturity of the technology compared to liquid propulsion, which implies more complex systems including for example cryogenic pumping circuits. Some of these startups believe this major advantage is sufficient to bring costs down and highlight the cost-effectiveness and competitiveness of launchers based on solid propulsion, such as Galactic Energy in an interview to 36kr in October 2018 . However Galactic Energy is also planning at the same time the Pallas-1 kerosene/liquid oxygen medium lift launch vehicle . This trend illustrates the fact that a part of these startups are working on solid rockets in order to “get the launch vehicle business started”. Most of these startups are funded by demanding private VC funds and may be under pressure to rapidly have a first successful launch before it can raise further rounds. Simple solid rocket prototypes are also a way to test a great range of instruments on-board for a more advanced rocket. This is the case for example of One Space’s OS-X series. One final reason for the strong presence of solid rockets could be the technology transfer from the military, something that is encouraged by the Civil-Military Integration Policy promoted by President Xi Jinping since 2015. As mentioned, a good half of these startups (7 out of 11) are also developing liquid propulsion. This is partly due to the intrinsic performance, but also the possibility to be reusable (although solid systems can sometimes also be refurbished, such as the Space Shuttle SRBs). Reusability actually seems to be one of the dominant reasons, as nearly all liquid propulsion rockets are being developed with a reusable design, often based on the return of the first stage through retropropulsive landing. It is striking to see the extent of the consensus around SpaceX’s business model within the Chinese private sector, while heated debates in Europe and Russia still take place on its sustainability. Among liquid rockets under development, there have also been different technical choices regarding fuel, with a 60/40 split between kerosene and methane engines respectively. Although methane has a slightly higher ISP comparatively and is less subject to coking (which makes it more suitable for reusable rockets compared to kerosene), there is a lot less experience with this technology, one of the first real methane engines worldwide being SpaceX’s Raptor… still under development. Kerosene has been considered by many founders as a safer technological bet for a startup fresh into rocket manufacturing (see for example Deep Blue Space ). One further observation: none of these launchers are using hydrogen (LH2/LOX) engines. This is simply due to the fact that all of these launchers are light/medium launchers aiming for low-earth orbit missions. LH2 is interesting due to its comparatively higher specific impulse, but is generally not cost-efficient in the lower atmosphere compared to kerosene or methane. More heavy lift Chinese rockets designed for GEO orbits such as the new Long March 5 have LH2/LOX engines, combined with kerosene boosters. While there are other rocket startups out there in China, the 11 studied in this article can be considered as the more “serious” ones. The others so far are either too early stage and have not unveiled their technological roadmap (Space Transportation), or seem to be an empty shell (Dragon Drive).